We offer a variety of cleaning packages to suit every type of job. If you have a specific request, please contact our customer support team to discuss. Our basic cleaning covers all the basics and is a light cleaning, perfect for when your home just needs a good refresher. Not every home is a candidate for a basic cleaning. If you plan on having regular service, it's best to start off with a deep clean. Our regular house cleaning will keep your home looking great after your initial deep cleaning. You can schedule weekly, bi-weekly, or monthly visits to fit your lifestyle. When you schedule recurring service, you receive your cleaning at a discount compared to one-time service. This is our highest level of clean. We typically start recurring customers with a deep clean to set ourselves up for success. A deep clean gets into every nook and cranny, even the places you didn’t realize were dirty. Additional tasks available: cleaning inside the refrigerator, inside of the oven, interior windows, and spot cleaning walls. Typically a vacant home cleaning, including the insides of all closets, cabinets, and all surfaces. Cleaning inside the refrigerator, inside the oven, interior windows, and spot cleaning walls are additional tasks commonly added to this service. Detailed Deep Cleaning is relative to the area of construction and customized to each home; ask for details. You'll love coming home to a sparkling clean home that has no harmful chemical odors, or residue. 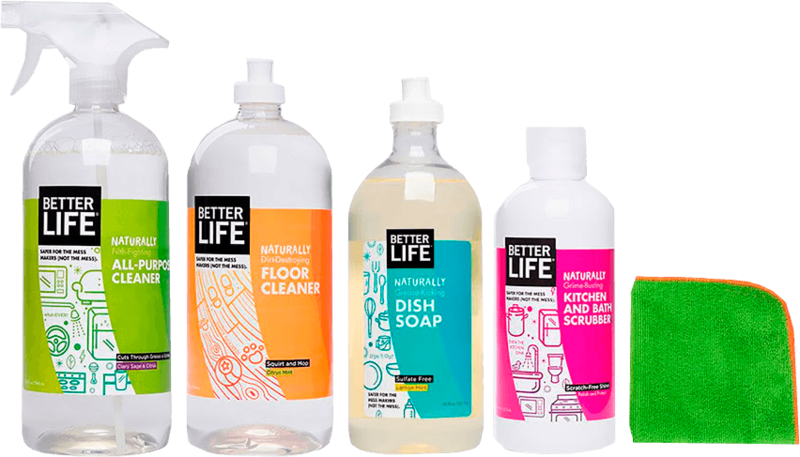 All of the cleaning packages use Better Life Cleaners. Are You Ready To Let Your Home Shine? We offer a 20% discount to all new customers.